Hello everyone, we at FastKlean are very excited to reveal that our professional Cleaning Company London is now being advertised on the side of London taxis. We are always thinking of innovative ways to reach out to those people who are in desperate need of professional cleaning because of increasingly high demands in the workplace as well as everyday responsibilities at home. It has been our mission in the last ten years as a cleaning business to give a helping hand to those who are really finding it hard to keep up with general cleanliness. This is not the first time that our Cleaning Company London has been advertised on London transport as last year we had posters up on underground trains in a number of areas, which proved to be quite successful in attracting business. 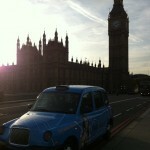 We recently had our first look at the actual taxi advertisement and are very pleased with the design. Hopefully those of you who live and work within the city will spot the taxis and also be delighted. We are confident that these taxis will help more people in the capital learn about our Cleaning Company London and the various cleaning services that our experts are able to provide. Whether you require highly skilled and experienced professional cleaners to visit your home or place of work; whether they are desired for a general spruce up or a more specialised cleaning service, such as treating dirty carpets, furniture or smudged windows, you can always rely on us to deliver sparkling results every time. If you would like to get in contact with a top quality Cleaning Company London and guarantee that all of your cleaning needs are fulfilled at the highest standard, and at incredibly competitive rates then call us on 020 8884 9149 for a free quote. You will be amazed at how much easier your life will be, knowing that all your chores are being taken care of on your behalf.